You ever feel like the room is spinning when you’re drinking? 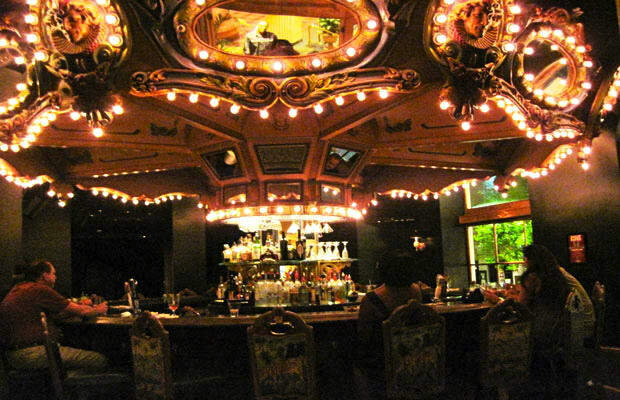 Well, The Carousel Bar takes that to another level with their rotating bar. The bar completes a rotation every 15 minutes, which makes for a good drinking game. However, there are only 25 seats at the bar, so getting a seat is almost like playing a game of rotating musical chairs. If you’re there to get trippy and not dizzy, you can sit in a booth and gaze into the artificial stars in the ceiling. Live entertainment is provided every night along with hors d’oeuvres served at cocktail hour. Nice place for an old-fashioned NOLA cocktail, to say the least.